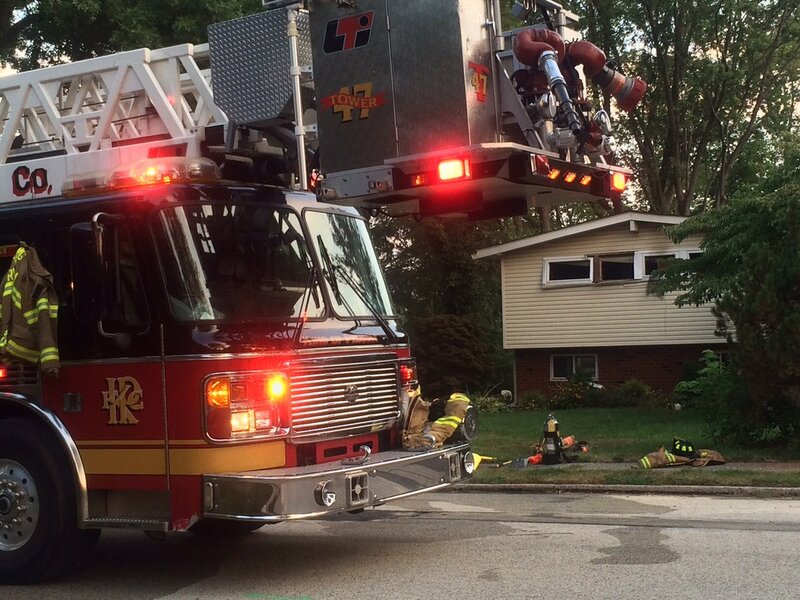 On Tuesday, August 25th at approximately 4:45AM the King of Prussia Volunteer Fire Company was dispatched with Engine 47-1 and Tower 47 to assist the Swedesburg Volunteer Fire Company (Station 49) on a dwelling fire in the 500 block of Dartmouth Dr. Tower 47 (A/C Molchany) and Engine 47-1 (D/C Camarda) each responded with a crew of four. Chief 49 arrived on location to confirm a working fire in the rear bedroom on the second floor of the house, and assumed command. Tower 47 was the first unit to arrive and was quickly followed by Engine 47-1, Engine 32 (Goodwill Fire Co.) and units from Station 49. The crew from Tower 47 split up with Lt. Larry Durland and FF Bob Smull stretching a 1.75” line to the front door while A/C Molchany went to the rear of the structure with a ground ladder to provide outside ventilation. The crew on the hose line made its way to the second floor and found the rear bedroom to be charged with smoke down to the floor with extreme heat conditions. As part of a coordinated attack, A/C Molchany provided horizontal ventilation from the outside, and the crew from Engine 47-1, Squirt 49 and Pipeline 49 went to the roof to provide vertical ventilation above the fire room. Upon opening up the room, the conditions became much more tenable to the crew working inside the structure. Firefighters from Engine 32 provided backup to the initial hose team and pulled the remaining ceiling to ensure that there wasn’t anymore fire in void spaces. Additional crews from Lafayette Ambulance provided rehab support and Swedeland Volunteer Fire Company provided manpower at the scene. Crews remained on location for just over two hours with no injuries reported.